Chop celery stalks into ½-cm/¼-inch pieces. Roughly chop tarragon leaves and mince shallot. Trim and thinly slice fennel bulb with mandolin. Core and slice apples on mandolin, then julienne. Toast pine nuts over medium heat until golden brown and fragrant, then set aside to cool. In a small bowl or blender, combine olive oil, honey, lemon juice, shallot, and salt and pepper until emulsified. 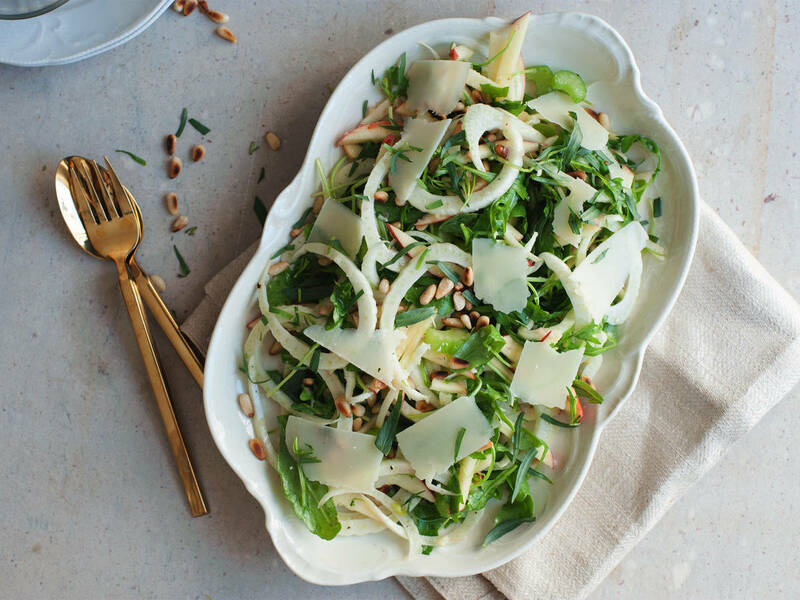 Add fennel, celery, apples, and arugula to a large bowl. Toss with dressing until combined, then adjust seasoning as needed. Transfer salad to a serving platter and garnish with shavings of pecorino, pine nuts, and chopped tarragon. Enjoy!